FRANSE, Delores June - Age 90, of Swartz Creek, formerly of Lake Fenton, passed away Friday, October 12, 2018. A Celebration of Life will be held 1 PM Tuesday, October 16 at Sharp Funeral Homes, Fenton Chapel, 1000 Silver Lake Rd., Fenton. Pastor Mark Cox officiating. Visitation will be 2-4 PM and 6-8 PM Monday; and 12 PM until the time of service Tuesday. Interment will be 10 AM Thursday at Oakwood Cemetery, Fenton. Contributions may be made to the Alzheimer's Association. Delores was born May 28, 1928 in Lansing, the daughter of John and Henrietta (Schultz) Murphy. She worked as an Assembler at AC Spark Plug for 30 years, retiring in 1977. Delores married Lyle Lee Franse in July of 1950 in Mississippi; and he preceded her in death on December 28, 1996. She was a member of the UAW Local 651 and a life member of the DAV Auxiliary. 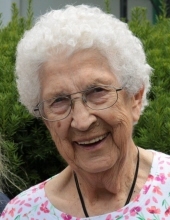 Delores enjoyed playing cards, traveling, golfing, snowmobiling, knitting mittens, crocheting, gardening, and camping. Grandma Do especially enjoyed spending time with her granddaughter Leena. Surviving are: her children, Ryan (Annette) Franse, Helen (Ed) Franse Hornlein; granddaughter, Leena June Hornlein; siblings, Eleanor Chaney, Kenneth Murphy; and many nieces and nephews, all loved very much. To send flowers or a remembrance gift to the family of Delores June Franse, please visit our Tribute Store. "Email Address" would like to share the life celebration of Delores June Franse. Click on the "link" to go to share a favorite memory or leave a condolence message for the family.